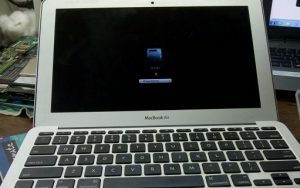 As we have already talked about, that we should have the skill to repair a Macbook. With experience, We should have a set method under which you will repair any device. 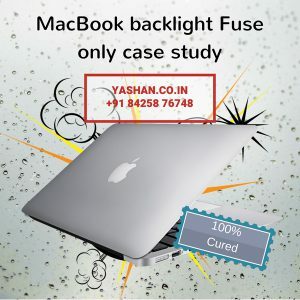 MacBook Air Backlight fuse Case Study is one of those. As you know, most of my Followers follow this PI-EO Method. In view of that, I have brought a different case Study in front of you. Note: To know More About PI-EO Method Follow Read My previous Article. You feel very lucky when you find Apple’s fault in the first Step. Yes, I am talking about PI-EO’s first Step physical verification. 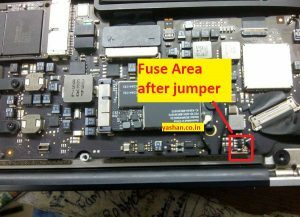 Here I got a lot of moisture over the MacBook Air BackLight Fuse. The tracks were completely destroyed due to water damage. After cleaning the place properly, the news was re-attached to a wire through. This work should be done very efficiently and carefully because if backlight supply gets touched by the ground or elsewhere then your entire system may get spoiled and the system will not work. First of all, that the supply made on the battery coil which is an 8 volt. Comes straight to your MacBook Air Back Light Fuse, and then it goes to your backlight Driver Mosfet. Fuse is applied to control over power. If there have any reason the Ampere increases in the next section then the further section does not get damaged and fuse got open. So All My Friends this is my another Apple case study. How much did you understand it, definitely tell me? Write down the comment below and do not forget to share it.